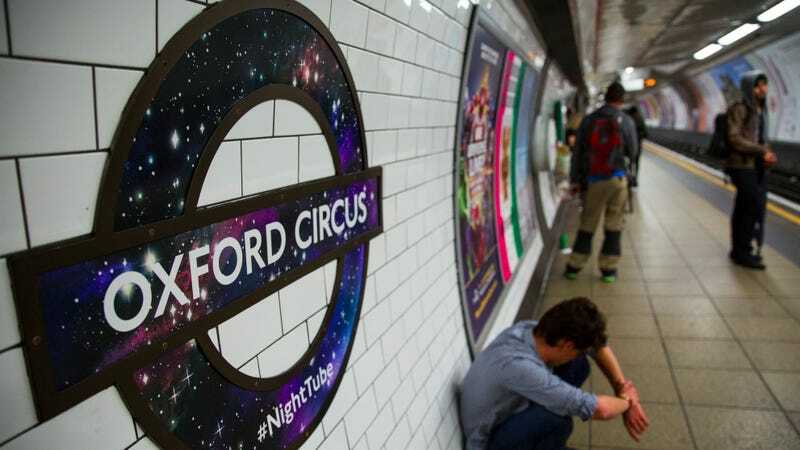 Are Londoners Riding the Underground Constantly Surrounded By Grinning Plague Ghosts? There’s a popular legend that the ground beneath London is riddled with the bodies of plague victims, and so every time you ride the underground, you’re essentially hurtling through dark spaces surrounded by slumbering plague skeletons. Is that really true, though? In a thoroughly researched piece for the BBC, which is worth reading in full, Amanda Ruggeri tackles the notion that London is riddled with plague pits—hastily dug mass graves for victims of the 1348 and 1665 epidemics—which had to be dug through or around for the nineteenth-century development of mass transit. If you look at a turn-of-the-century underground map, she notes, the various lines “don’t take the straightest, fastest line from point A to B. Instead, they meander. They curve. Almost like they’re avoiding something.” Folklore has insisted that something is bones—veritable thickets of bones. But for a phenomenon supposedly so pervasive, Ruggeri had quite a bit of trouble tracking down substantiated plague pits encountered during public transit construction. When I asked London’s transport historians about the plague pit-Tube connection, the overall response was a collective eye-roll. One after another told me that, in all of their record-scouring of Underground history, they’d never come across any mentions of plague pits. “In all of the work I have done and am doing I have never encountered anything that suggested real or imagined plague pits influenced the construction of the London Underground,” Tube historian and author Mike Horne wrote in an e-mail. Generally, Londoners put as many of the bubonic dead in existing cemeteries as possible. There were a limited number of emergency burial grounds constructed for London’s bouts with the plague, but even they likely weren’t the yawning, disorganized holes in the ground dug by panicked survivors the name evokes. Evidence suggests that bodies were actually carefully laid to rest; as University of London historian Vanessa Harding explained: “The plague is a terrible experience for Londoners, so in some ways they cling on to things that they’re used to, that give them stability and comfort.” For instance, burial that were as proper as possible under the emergency circumstances. The shape of the early underground likely had more to do with cost and right-of-way than plague pits. Forget Victorians uncovering bone-packed pits wherever they turned; the primary instance of a public transit project encountering plague victims was a 2013 excavation associated with the Crossrail extension. Some of that is from former burial grounds that lost their churches in the 1666 fire. More often, though, it’s because of a law passed in 1852 to close the city’s cemeteries. And whether the underground truly meanders through plague pits or simply long-forgotten cemeteries doesn’t change the fact when you’re making your way around somewhere as old and continuously inhabited as London, you’re always surrounded by the dead. Wave hello to the ghosts!